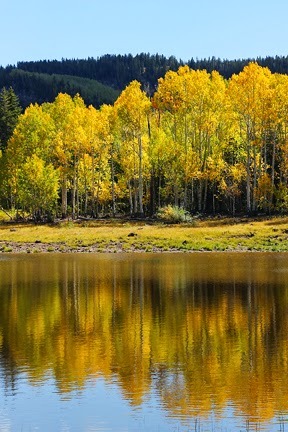 Grand Mesa is known for its many lakes and, of course, it's especially beautiful when the colored leaves and lake water come together for a photo with a reflection. Some of the lakes have sadly emptied of water quite a lot but this reservoir was still full. The sun cooperated and there was just a bit of wind so it all came together nicely. But you should see it in person. There's no good substitute for that.